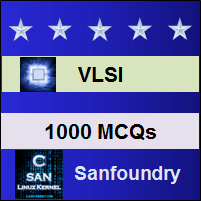 This set of VLSI Mcqs focuses on “Guidelines for Testability -3”. Explanation: Counters are sequential circuits and need a large number of input vectors to be fully tested. Explanation: Since reset input is independent of system clock signal, erroneous readings are being read by the tester. Explanation: Self resetting can be avoided by adding an OR gate which over rides the tester. 4. Partitioning technique is not suitable for micro processor like circuits. Explanation: Partitioning technique is very widely used for microprocessor like circuits and using bus structures is related to partitioning technique. Explanation: The fast rise and fall times of digital signals can give rise to croo-talk problems in analog signal lines if they are in close proximity. Explanation: To route digital signals near analog signals, balancing and shielding of digital signals must be done. Explanation: To directly access another sub-system to be tested from one subsystem, by-passing must be performed. Explanation: With partitioning, to directly access a sub-system for testing, bypassing must be done and this is achieved using multiplexers. Explanation: Bypassing technique works well with counters, dividers, RAM, ROM, PLAs, sequential blocks, analog circuits and internal clocks. Explanation: In the bypassing approach, subsystem can be tested exhaustively by controlling the multiplexers based interconnections in the system. To practice MCQs on all areas of VLSI, here is complete set of 1000+ Multiple Choice Questions and Answers.